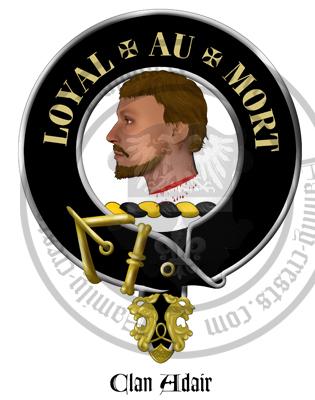 Clan Badge: A mans' head couped and bloody. The name of Adair seems to be a variation of Edzaer, and these two names are shown in various deeds in the Lochnaw charter chest to be interchangeable with the Adairs of Galloway. Many of the Galloway Adairs settled in Country Antrim, having travelled to Ulster during the Elizabethan plantation. 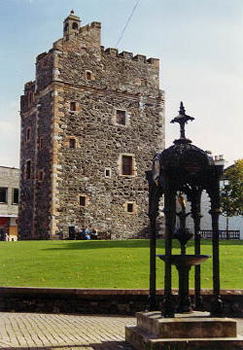 The first of the name is believed to have been a son of Duvenald, who was grandson to Donegal of Morton Castle, and who lead forces at the Battle of the Standard in 1138. Patrick Adair, who setteld in Antrim in 1641, became known as the author of a text on the growth of the Presbyterian Church in Ireland. James Adair, a pioneer of the Americas, wrote of the earliest histories of the native Indians and died in 1783. Sir Robert Shafto Adair of the house of Kinhilt was given a baronetcy in 1838, and his son was Baron Waveney of South Elmham, Suffolk, this title devolved upon his younger brother, whose lineage stiill exists. Arms: Per bend or and sable, three dexter hands apaumee and erect, two and one gules. Crest: A mans' head couped and bloody. Kinhilt and Genoch in County Wigton, Scotland, also Heatherton Park in Somerset and South Elmham in Suffolk, England, and County Antrim, Ireland.